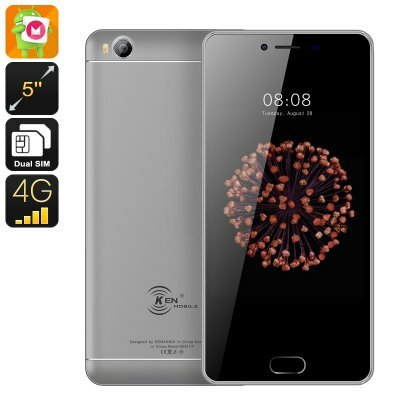 Successfully Added HK Warehouse KEN XIN DA V7 Android Phone - Android 6.0, MediaTek CPU, 2GB RAM, 5 Inch HD Display, 2250mAh, Dual-IMEI, 4G (Grey) to your Shopping Cart. Always stay in touch with friends and family with the KEN XIN DA V7 Android phone. This affordable smartphone comes with two SIM slots and features Dual-IMEI numbers. Thanks to this, you’ll be able to stay connected to two network providers simultaneously. Therefore, you can always be reached on two different phone numbers while using merely one Android device. This makes your Android phone perfect for separating work and private life. Additionally, it brings along great efficiency for those of you that often travel abroad. With this Android phone, you’ll be able to connect to the mobile network abroad at local fares while simultaneously staying reachable to friends and family back home on your old familiar number. Running on Android 6.0, this smartphone brings forth a smooth yet powerful performance. Along with its MediaTek 6753 processor and 2GB of RAM, it lets you enjoy the latest software features available. With access to the Play Store, you can download games, movies, Apps, and more. All these media can be enjoyed on the phone’s 5 Inch display without experiencing any lag. By bringing forth crisp 720p HD resolutions, this Android smartphone is guaranteed to treat you with stunning visuals. The screen has furthermore been crafted out of Corning Gorilla Glass 3. This makes it extra durable and resistant to scratches and slight impacts. Along with its sophisticated hardware comes a 2250mAh battery. This cell brings forth 4 hours of continuous usage time. Therefore, you’ll be able to enjoy all your phone has to offer throughout the day. With 16GB internal storage and an SD card slot that supports up to 128GB, there will be plenty of space for you to store your files and media. You can either download them straight from the App Store or stream films and series online. With 4G connectivity, you’ll always be able to browse the web at lightning speeds. No matter what type of smartphone user you are, the KEN XIN DA V7 is sure to meet all your mobile demands.